5. There are 4 features that together help you find better teammates for 4PE Dungeons like Storm Mesa. 6. The mod will automatically filter the stats of team members of the team you join. So you won’t end up starting a dungeon with low-level players. 7. To use, simply set the requirement of the level of the team’s best hero and the number of team members(including yourself) that meets the condition. 8. Then input the search times you want the mod to run. The mod will automatically filter the stats of team members of the team you join. So you won’t end up starting a dungeon with low-level players. In v. 1.1.0 BattlePower i.e. Might of the Team is Added as another condition of search. This feature works alike. 9. To activate, you need to first tap “Join Team” and then “Exit” once. 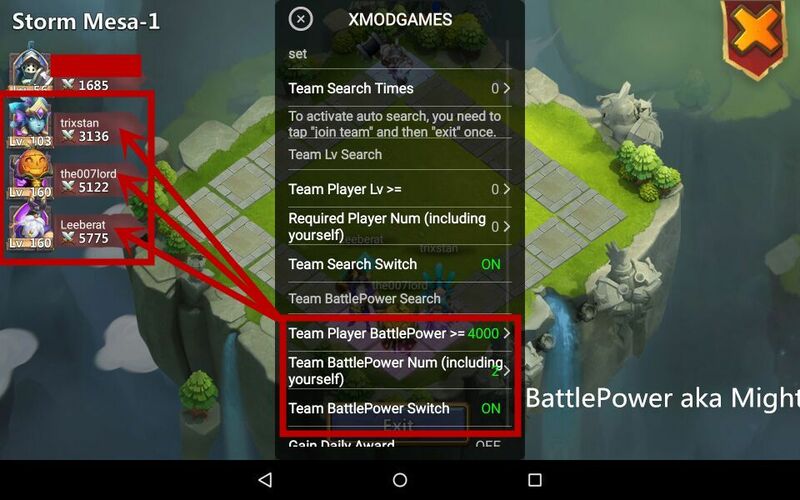 The next time you tap on “Join Team”, the auto-search will start untilthe team setting reaches the condition or the valid search times run out. 10. If the team members data do not meet the requirement, it will keep on searching until it finds one, though high level team leader may still kick you becuz of the low might. 11. At least you won’t waste the precious stamina for 4PE fight becuz of joining low-level team now. 12. Barrack Assist helps you fill the barrack with the selected troop unit, saving you from repetitive clicks.